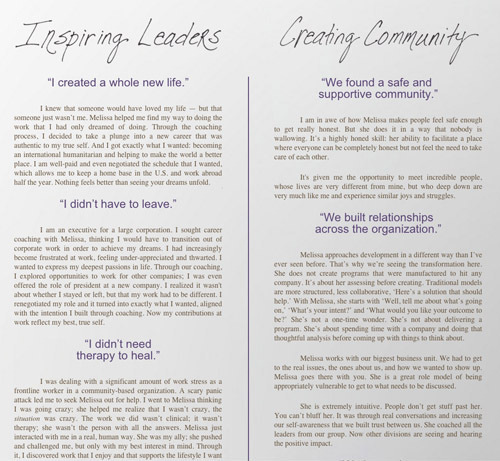 Melissa Kopplin is an incredible leadership coach and facilitator; she wanted her website to communicate the same whole-hearted, authentic presence she brings to her work. Working together, we decided that a series of open, honest portraits should be the star of her site, supported by the personal touch of her very own handwritten headlines. The home page poses evocative questions for the visitor, capturing Melissa’s own voice and style. I also interviewed a number of Melissa’s clients to gain insight about their experiences working with her—then wrote six short stories from their perspectives. I am an executive for a large corporation. I sought career coaching with Melissa, thinking I would have to transition out of corporate work in order to achieve my dreams. I had increasingly become frustrated at work, feeling under-appreciated and thwarted. I wanted to express my deepest passions in life. Through our coaching, I explored opportunities to work for other companies; I was even offered the role of president at a new company. I realized it wasn’t about whether I stayed or left, but that my work had to be different. I renegotiated my role and it turned into exactly what I wanted, aligned with the intention I built through coaching. Now my contributions at work reflect my best, true self.